Nothing good ever comes easy. It’s one thing to have an idea, to mull it over in the mind and keep refining it but the hard part is going through the process to take it from a single thought all the way to an actual ‘thing’ that people can watch, read or listen to. It takes a hell of a lot of effort in all cases and I strongly admire anybody who gets to their own individual finish line. One such example happened a couple of weeks ago when I attended The Source Cafe in Carlisle for the double album launch from two local bands The Unsung and We Are Quasars. I’ll have to add some disclosure here and say that I’ve worked with Craig from The Unsung for a good few years now. Both bands actually had a gig at The Old Fire Station in Carlisle back in November. I was at that one too and both were sounding really good back then but the albums were still being worked on and tweaked at that stage. Tonight they were ready to go as evidenced by the pile of CDs on the merch table on the way in. You should buy both albums. I know you’re probably thinking that I’m bound to say that because I know The Unsung. The truth is that I was always going to buy their album and We Are Quasars as well because I enjoyed listening to them so much back in November. 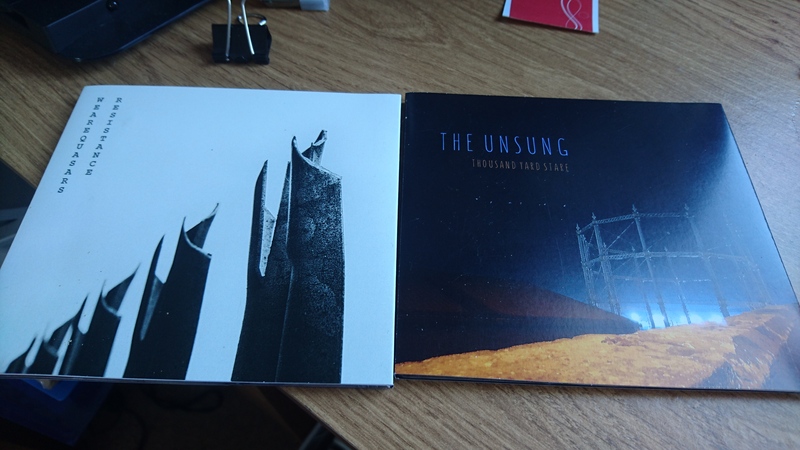 The added bit to all this is the fact that both albums are brilliant and are well worth your time and money even if you’re not from Carlisle and don’t know anybody in either band. They stand solid in their own right. The Unsung make melodic music with a certain darker edge. They remind me a lot of Interpol and I mean that as a surefire complement. because I love Interpol. We Are Quasars sound a little bit like Muse before they became too concerned with how much stadium they could fit into their stadium rock. There’s a vein of anger floating through their songs. Not all out firing rage but the calculated, fine needle type. You can listen to The Unsung here and We Are Quasars here. I suggest you do. Why am I telling you all of this is a blog about writing? Well here’s the crossover. As I stood listening to both bands in a room which seemed to be getting hotter and hotter with each passing minute (the insulation is good for soundproofing but maybe not so great for getting any air into the place) a thought smashed into my head. Here’s two groups of people who have taken sounds that were raw and incomplete, put them together, arranged them and recorded them. Here they were, a few months later, playing the final versions and selling the physical result. Forget turning lead into gold, this is alchemy. I was having a bit of a tough time with the book. The flow wasn’t quite there and nothing was really coming together. Not only was the music good, the company fantastic but it was also an evening when inspiration walked up to me and smacked me in the head the friendly kind of way. This collection of strange goings on and stranger people can be blended together and eventually there will be a final result for people to read. Regardless of the format it’s a very similar process behind it. If you’ve made an idea exist for everybody else to see then you deserve all the credit. ‘Support good people making good things’. So I get back to the book. The chapter from Hell is over, long live the next one. Finally I’ve reached the end of a chapter that will probably be first on the list for future rewrites being as I was bored writing it so heck knows how dull it would be for anybody to read. On occasion the fact that I had originally thought of this as a feature film comes through and it results in sections when it all feel a bit too ‘visual’. Whilst this kind of stuff would look great up on screen, perhaps with some music over it, it doesn’t translate well to fiction. Having the character of the missing girl’s Mother return to the house she lived in when her daughter vanished is great in theory. I wanted her to go in thinking that she would connect with happier memories contained within this building. As her time there goes on however she discovers that the building is now in a state of near ruin and is covered in graffiti referencing the fact that most the townspeople had an idea she had killed her own daughter. The word ‘Murderer’ in painted across the front door in red letters. Now comes the turning point of the story so far. In various dark corners of the house there are patches of what might look at first glance to be spider’s webbing. It contains small stone like pods in it though. Her Daughter, who unknown to her Mother yet has returned, has a small ring of these things just underneath her skin. The chapter kind of snaps into alien stuff fairly quickly. In fact, here’s what I ended on. Morag had to leave. She about turned and paced across the landing towards the top of the stairs. She gingerly went back down the steps, taking them as quickly as she could before putting her feet back in the hallway and pacing out of the front door. She navigated her way through the long grass of the front garden before taking a sharp turn out of the gate down the street. She didn’t want to look back any more, she warned this house to be forgotten now. If it crumbled into dust tomorrow, taking everything with it, then she’d need to prepare herself not to care. In a dark recess under the stairs another pile of dust landed in the webbing below. If anybody had noticed it they would almost certainly have thought it could have been a spider’s web. Perhaps then they would have investigated further and discovered that the web was nothing like the thin, delicate thread of any arachnid. It was thicker and faintly blue. Gathered amongst the network were small, hard, light blue stones. Each of them pulsed and throbbed to an unheard of rhythm. One of the stones then fell from the strand it was held in and landed on the bare wooden floorboards. It then liquefied, oozing outwards as if reaching out for help. Before long it was like a tiny star, arms reaching out and pulling itself along bit by bit. A second one soon followed. Well it had to end on some kind of intrigue didn’t it? A woman wandering around a derelict house wasn’t exactly going to provide such kicks. I’ve been occupied elsewhere recently, the book hasn’t had a lot of a look in for the last few days. I’ve either been working or preparing for the recording of a podcast episode we’re doing this Tuesday. Not helping this situation is the fact I seem to have a heavy cold for the past few days which I hope is in the process of leaving me alone now. I’m grinding my way through this chapter whilst constantly thinking there will be far better on the immediate horizon. The character of the girl’s mother has no clear reason to return to the town. If her life was going so well in the city she moved to then why on Earth is she spending these few days going back to the place she couldn’t wait to see the back of. When I was planning all this at the start of the year this detail felt inconsequential but it’s become ever more critical the further I get into it. As such she’s currently just walking around the town and revisiting old places. It’s great by the fact I get to write about her memories and give a backstory that way but it’s also really bloody dull in places. It’s reflecting really badly on her character as well. She’s a pain to write at the moment and it’s part of the reason why I’ve stalled a bit. I’ve done another small chunk tonight (about 200 words) which I started at around 10pm. I’ll get some more done tomorrow night as well but then it’ll be Thursday before I can have a good swing at it through the day. It’s time to get back to work. I adore Doctor Who and have done since I first watched it around 1986 when I was about five years old. Here’s the latest episode of The Polis Box in which Doctor Who is discussed in great detail. Sometimes I pop up to give my opinion on the pressing TARDIS related matters of the day. It’s also really bloody good. I’ve been looking back over the book in the last couple of days. Nothing as far as a serious edit goes so far because that’ll probably come at the end. I am however struck by one thing right now. It’s obvious that I was thinking about doing this as a film before it became a book. Everything is broken up in ‘filmable’ parts. One of the best things about writing fiction again after many years of writing scripts is that I’m not worrying about how a producer would be able to get whatever it is I’ve thought of up on screen. If I have something in mind and I can describe it then I’m good to go. As it happens so far though I’ve still restricted myself to only a few locations and not many action sequences (the last chapter with our policeman character discovering and running away from a very strange presence coming up from the sea by the beach is an exception). Perhaps it’s good that it’s a fairly tight story in that sense but it does feel like I’ve been describing the same three or four places for a long time now. Two characters are about to have coffee and a frank discussion at the aforementioned American themed diner in the town and that’ll be a totally new location so at least that’ll be a change. I have a strong mental image of these places almost to the detriment of going anywhere else. I didn’t originally have a location for this story. I knew it was going to be in Scotland but I wasn’t sure where exactly. This was until I went on holiday last summer to a small town in Fife called Pittenweem. We stayed in a flat that had a view down the street towards the harbour and out to the sea beyond that. There was a brilliant feel of a small Scottish town alongside a rich vein of strangeness. I spent a couple of nights walking around alone once the sun went down as Jamie the policeman does in the book. It’s this place that I’ve got in mind when I’m writing such location as the harbour and the beach. This was the view from the living room window. The only problem at the moment with the location is that it doesn’t yet have a name. Every single ‘Scottish sounding’ place name I’ve thought of seems to already been taken. All The Way To The Moon. The end of the difficult chapter, the proper introduction of our alien being and a tap on the shoulder when one character is least expecting it. Chapter ten is now in the book. I’m currently still messing around with timelines. There’s two in the book covering events from ten years previous and the girl’s initial disappearance and then the present day with her return. I’m using the same characters but flicking back and forth between the two. Sometimes the same character will visit the same location but ten years apart from each other. Certain character’s recollection of past events might differ from what actually happened. I’m trying really hard not to make it a complete mess of confusion but it seems okay so far. I’m trying to lay down markers that determine time such as buildings changing. We’re up to 17,200 and still knocking on. In the meantime, a view from the desk. That’s the moon up there somewhere.